Following reports that February was the 'toughest month to date' for the NHS, it is clear that the healthcare sector must make better use of technology to successfully transition into the digital age. According to research, accident and emergency (A&E) hospital waiting times have hit their worst level since NHS records began, resulting in February being deemed the 'toughest month to date' for the NHS. Around the world, people are living longer – often with chronic disease. This is putting increased demand on healthcare systems, which may already be experiencing a shortage of qualified personnel. Just as the demand for healthcare is ramping up, many countries and their healthcare systems are experiencing a shortage in physicians, nurses and allied health professionals. According to recent news, the NHS is facing a staff shortage crisis that could mean it has 250,000 vacancies in a decade. Whilst the struggle the UK’s National Health Service (NHS) is currently facing is evident, the tightening of government purse strings is continuing to have a damaging effect on not just patients but also doctors, nurses and support staff. In order to help combat these matters and improve the quality of care, the NHS needs to re-evaluate its communication systems, from not only an internal perspective but also within doctor-to-patient relationships. To efficiently exchange clinical data, while remaining compliant with regulations imposed by the industry, there is a need for the NHS to adopt mobile-first technology that allows complete visibility over all mobile operations across the healthcare system. But how exactly does the NHS achieve this? Globally, mobile technology is revolutionising healthcare and increasing the standard of care for patients. 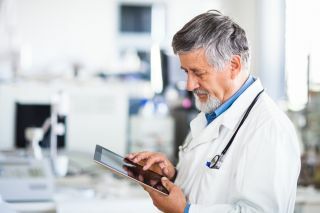 Practitioners are using mobile devices to improve the standard of care, both inside hospitals and remotely, by helping to streamline clinical workflows, improve the speed and accuracy of diagnosis and treatment, and strengthen patient communication. For many CIOs, mobile devices and applications also have the potential to impact non-clinical workflows and hospital operations. These include self-registration kiosks, appointment scheduling and the ability to remotely allocate tasks to porters based on location, priority and workload. Mobility solutions such as these decrease the time practitioners spend on administration, allowing them to devote more time to patient care. With a hardware agnostic solution, IT departments and help desks can have a single, integrated, real-time view across their wireless networks of all deployed devices. Data privacy is a major concern for the healthcare sector. Some believe that migrating data from legacy equipment, even paper, to new digital devices, may compromise security and privacy. Recent cyberattacks on the NHS, such as the WannaCry ransomware attack, haven’t helped both internal and public perception. For the hospital or healthcare organisation, the cost and consequences of healthcare data breaches can be significant. In addition to lost customers, remedial action can include litigation, forensic investigations and security audits. As if being the primary target of most hacking, phishing and ransomware wasn’t enough, the IoT is making security for healthcare much more difficult. As more endpoints and connected machines enter the healthcare industry, hacking, data breaches, and ransomware have the potential to become much more likely, and dangerous. With the right solution in place, Trusts can safeguard sensitive patient data more securely. If a device is ever lost or stolen, IT can immediately lock and wipe it, ensuring the organisation avoids penalties and damaged reputations from breaches. A geo-based tracking feature will ensure the device is eventually found – once paper is lost, it’s lost. Devices can also be encrypted for secure data transmission when using notoriously insecure WIFI networks. Decision makers within the sector must look to integrate a robust and mobility management solution in order to improve upon efficiency within the healthcare industry. To be successful in its transition into a digital age, the NHS must make use of mobile technology and take a unified approach to the management of mobile devices, applications, content and data. Ensuring reliability and security measures are rock solid will be crucial for building confidence and reassuring those in the sector that new sources of data are being traced and managed effectively. Whilst this is not the only solution, integrating a mobile-first approach will act as a solid starting point to overcoming the challenges the NHS is currently facing. This short-term expense will be the key to boosting efficiency and improving patient care, providing a long-term gain in the healthcare sector.